Phoenix is hot, so cool off at SEA LIFE Aquarium Arizona, where you’ll dive in and be wowed by the many strange, beautiful and fascinating creatures of the deep. 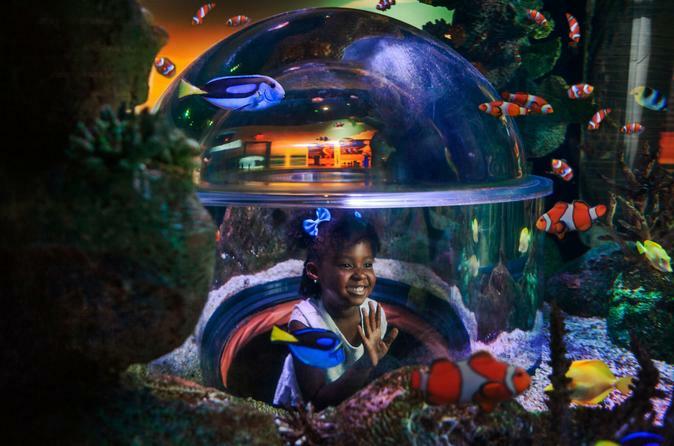 You’ll journey through an amazing underwater world and get astonishing close-ups of everything from the humble starfish to tropical sharks, all in displays that carefully recreate their natural habitats. SEA LIFE Aquarium Arizona transports you into the amazing ocean world, providing close encounters with a vast array of creatures from starfish and seahorses to stingrays and sharks. Make your way through the exhibits from the Arizona park lakes to river canyons and caves. Arrive at the shoreline of the Pacific Ocean, and come face-to-face with the amazing inhabitants of the sea. Become a rock pool explorer as you discover the wildlife of the rocky coastline and the shallow seas, then venture to the dark ocean depths. At every step, there are amazing creatures to discover. SEA LIFE Aquarium Arizona hosts educational talks and demonstrations throughout the day. These include shark and ray feedings and talks on sharks, seahorses, rays and rock pools. Special Offer - Book with us and save 7% compared to the local admission price! - Book Now!